PLEASE READ: the flow for this strech is incorrect. 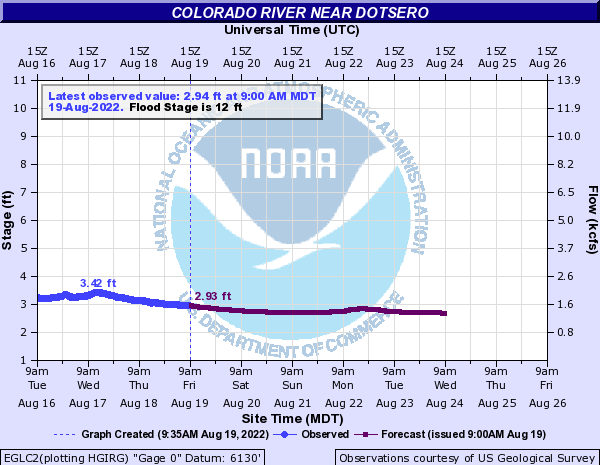 The gauge used is just downstream from Dotsero where the confluence with the Eagle River is. So the flow on the strech from Burns to Dotsero is not what is shown here. Unfortunately I don't know how to edit the gauge, maybe someone else can do this. From Burns to I-70 there is really only one significant rapid (Burns Hole / Rodeo Rapid). The rest of the float is easy scenic Class I water at most water levels with a few Class II+ sections at above-average levels. Many access spots here allow for lots of day trip options. Camps and lunch areas are available here for those coming down from higher up the river. Rodeo Rapid at low water levels is almost unrunnable due to the rocky nature of the rapid. At flows below or around 1000 you may have to portage or walk around this rapid. Scouting is recommended. You can access the river by walk on or a small dirt ramp here. Car and river camping available at Lyon's Gulch as well as a dirt boat ramp. Pit toilets are available as well. The Dotsero ramp is on the north side of Highway 6 on the east side of the river, $5 parking fee. Pit toilets but no camping is allowed here. Great put-in/take-out with free parking and pit toilet. Pull in right of center between 2 large rocks and follow the main current down. Scout from either bank above the rapid if you wish. Rocky rapid as it passes underneath a bridge. Scout from the right bank or the road. Stay right to be in the deepest current. Small camp on river left. Several camps exist on the well sized cottonwood island. Either channel around the island is floatable at most water levels. An awesome car camping spot. Boat to or from camp, river front campsites, no fees and a pit toliet. What else could you wish for?